Celebrate Co-op Week with Modo, October 16-22! Join us in celebrating Canadian Co-op Week from October 16 to 22! Co-op Week is a good time to reflect on the seven Co-op Principles that have helped shape Modo for nearly 20 years and set the foundation for our vision, values and objectives. One of the Co-op Principles is community. And among of the best ways to foster community is through sharing stories. 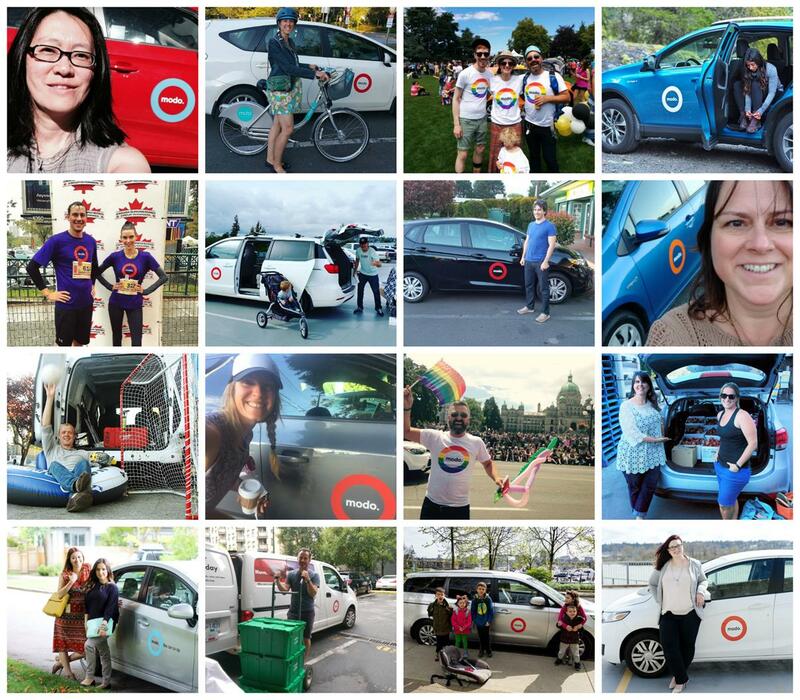 It is also a great time to join a co-op and support the sharing economy. Co-ops are represented in most sectors; find them all at BCCA. Whether it's members telling us what they think of our newest Modo location in Saanich online, engaged volunteers at our events like Bike to Work Week and Victoria Pride, or Business members like Thinklandia and My Accio sharing their Modo stories, our members' participation and engagement is what keeps us connected to our members and determined to do our best! Stories strengthen our co-op community. Share yours with us or participate as a Modo Ambassador. Email marketing@modo.coop your story or a link to your blog and/or social media profiles if you'd like to be an ambassador. NEW LOCATION at Rutledge Park: You can find a 2016 white Toyota Prius (#816) in an on-street space adjacent to Rutledge Park, on Inverness Road just west of Glasgow Avenue. If you have potential leads on available parking in and around the Victoria area, please let us know! We're particularly interested in visible, accessible surface in Jubilee, Vic West, and Downtown, where we could put a Modo sign and reserve a permanent stall. NEW LOCATION at Capitol & Springer: A white 2016 Honda Fit (#837) now lives in the 5100 block of Capitol Drive, between Glynde Avenue & Springer Avenue. UPGRADE at Cameron Rec Centre: a 2017 white Toyota RAV4 Hybrid (#834) has replaced the 2009 Nissan Cube. UPGRADE at St. Andrews & E 3rd: a 2016 white Honda Fit (#833) has replaced the 2011 Mazda 2. We no longer have vehicles at The Rise or Fairview Vancity. The grey Nissan Versa (#438) has moved from Fairview Vancity to City Hall Surface Lot. The blue-grey Nissan Sentra (#566), the white Nissan Sentra (#508), and the blue Mazda 2 (#360) have all moved from Fairview Vancity to a new location at City Hall - Cambie & 12th Ave. Since we now have two clusters of cars along the upper deck of City Hall, we've renamed them City Hall - Cambie & 12th Ave and City Hall - Yukon & 12th Ave so that they're easier to tell apart. NEW LOCATION at Maker Labs: a 2015 white Nissan NV 200 cargo van now lives on the southwest corner of East Cordova Street & Hawks Avenue, beside 780 Cordova. UPGRADE at 1869 Parker @ Victoria: a 2016 grey Toyota Prius C (#829) has replaced the 2011 Nissan Versa. UPGRADE at Kitchener: a 2016 grey Toyota Prius C (#831) has replaced the 2007 Yaris. UPGRADE at Kootenay Loop: a 2016 red Honda Fit (#828) has replaced the 2009 Toyota Yaris. UPGRADE at Grays Park: a 2016 white Honda Fit (#827) has replaced the 2012 Toyota Matrix. NEW LOCATION at 1315 Broughton @ Harwood, or Stephen Court Apartments. We've placed a 2011 black Nissan Leaf electric vehicle (#408) in the underground garage, in EV parking. UPGRADE at Barclay Place: a 2017 silver Toyota Prius (#832) has replaced the 2007 model. 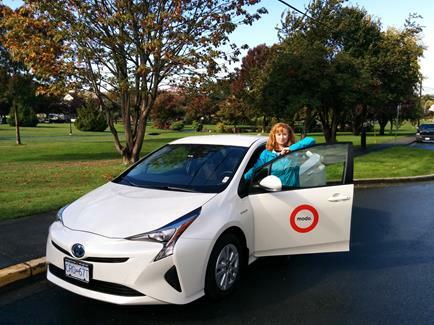 UPGRADE at English Bay: a 2016 red Toyota Prius C (#830) has replaced the 2012 model. Are you allergic to pet hair, perfume, flowers, nuts or chocolate? Modo has you covered. Our allergen-free vehicles are safe for members with allergies. MLT team member Dana explains more on the blog! If you've never driven a car with push button ignition, you might be intimidated when you reach for the key and can't find one. Don't worry, Farrell explains how to start your trip (and end it) in a few simple steps! Find a new Prius hybrid at Rutledge Park, right at the corner of Inverness Road and Glasgow Avenue. 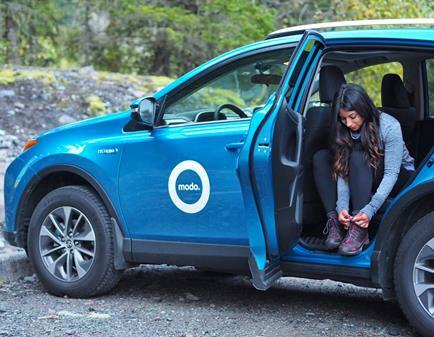 As a Modo member, you're part of the only carshare co-op in the Lower Mainland and Victoria. But we're curious: Are you a member of any other co-ops? Starting October 7th and ending October 27th, bookings in these cars are 10% off! >> FOOD CONNECTION A youth delegation from Collingwood Neighbourhood House went to Penticton for the annual Food Gathering with two Modo vans! 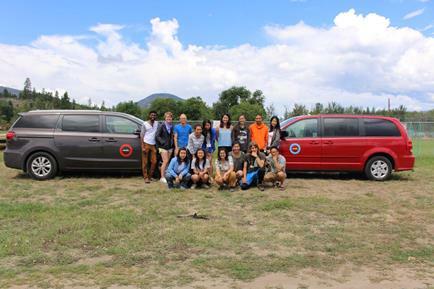 >> MODO SURPRISE Modo Ambassador Elicia Elliott organized a welcome surprise with the help of a Modo! >> MOVE WITH MODO Three businesses moved with the help of Modo's vans and trucks in September. 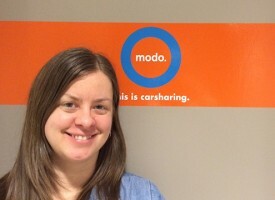 Share your moving day with us, use #ModoMove! >> THINKLANDIA The Thinklandia team used the Dockside Green Modo cars to organize this great event, celebrating arts, culture and public activation in Victoria! >> IKEA SHOP Modo Ambassador Jillian Glover did a big IKEA family shop with the help of a Modo minivan! >> RIFFLANDIA Four lucky members got to visit the Rifflandia music festival with free tickets from Atomique Productions and Modo. Carla Smart of My Accio found a ticket in a Modo at her doorstep! Submit your film entry for the Cinevic Gilm Festivus by October 18th (films must be completed and delivered by November 25th). The Festivus event takes place on December 1st! The YOU Shows are Intrepid Theatre's platform for local emerging artists to launch their new work. Check the event page for upcoming shows!